Welcome to remotecodelist.com a site born after losing one too many universal remote manuals. If you have a remote for which you know the codes (or a web page that lists them) head to the contact page to submit them. Note: This site does not sell remotes, it is merely a list of remote control instructions and codes. Again, this site does NOT sell remote controls. Remote Central (34) Site for high-end programmable remote controls. Includes reviews, files, forums and more. Remote Central's Uploaded Manuals (34) Contains hundreds of manuals uploaded by users. AT&T 200 (4) PDF manual. AT&T 200B (1) Set-top cable box. AT&T 200C (1) Set-top cable box. Tune In! (Archived) (2) User guide, including setup instructions. BW-5020 Partial list of codes. Comcast DVR 3-Device (4) PDF remote manual. Comcast Remote Overview (4) Provides a list of remotes used by Comcast and links to their instruction manuals. Try code 0451 for White Westinghouse TVs. 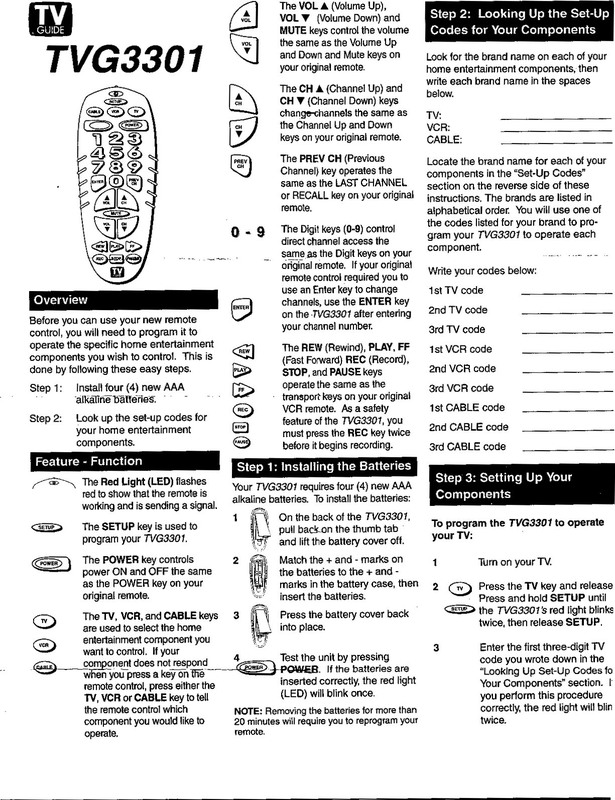 Comcast OnDemand 3-Device (4) PDF remote manual. Comcast On Demand Custom 3-Device Universal (4) PDF instruction file. Cox Cable Remote Control List (5) Various remotes used with the Cox Cable system. More Cox Remotes (5) Includes Cox Digital Interactive, Universal DVR, Navigator, Millennium and Model ER1 PDF manuals. Cox Universal Remote (5) Cox Universal Remote by Universal Electronics. CheckMate IV (5) Model RT-U49E universal remote. CheckMate IV (5) Model RT-U49C universal remote control. Scientific Atlanta Remote Codes (5) SA2000 universal remote codes. Atlas DVR/PVR 5-Device Cox DVR remote by Universal Electronics. M7820 Universal Remote Cox DVR remote by Universal Electronics. Various Models? User submitted general instructions that may pertain to various Curtis Mathes modes. User Guide List (8) Links to receiver and remote control user guides. Dish Remote Codes (8) Direct link to codes for Dish remotes. GE Universal Remote Codes (15) Links to PDF and Word document instruction and code files. GE/Jasco Model Remotes (15) Various GE remote models. GE Remote Codes (11) General instructions for GE Universal 3 and 4 digit remote controls. DirecTV Receivers (7) Models: GRD33G2A and GRD33G3A. RM24912 Instructions PDF instruction file. RM24912 Code List PDF code list. Quik30 Instructions and code list. Quik50 Instructions and code list. DirecTV Receivers (7) Models: HDVR-2, HAH-SA, HBH-SA, HIRD-B1, HIRD-B2/B3/B4/C2, GAEB0-GCEB0, GAEB0A-GCEB0A, GXCEBOT, HIRD-D01/D11, HIRD-D2, HIRD-D25, HIRD-D45, HIRD-E1/E2, HIRD-E4, HIRD-E6, HIRD-E86, HTL-HD, SD DVR40, SD-HBH. Jumbo Universal Remote PDF Instruction Manual for this oversized remoted. inVoca PDF manual for the inVoca voice-activated remote. iWave Super-Sized Universal Remote User-submitted instructions and codes. Jumbo Universal Remote (54) PDF Operation Manual. JVC Service (18) Search for your component's model number. Remote for XV-S500BK/XV-S502SL DVD Player (18) PDF manual for remote control that comes with the XV-S500BK or XV-S502SL DVD players. SC-300 Series PDF code file for models SC-310, SC-320, SC-330, SC-340, and more? SC-330, SC-331, SC-340 PDF user manual. SC-540 Programming Instructions PDF (~3MB). JR300C, JR400C, JR500C PDF instruction manual and codes for JR300C, JR400C and JR500C Jensen remotes. Kenwood USA Web Site (19) Currently under construction, Kenwood is reworking their site. RC-R0609 Codes for the remote that comes with the 503 home theater. La-Z-Boy Branded Remotes (20) Includes models LZ6100, LZ6152, LZ6220 and LZ6200. Various Models? (23) Some Magnavox remotes reportedly only accept 3 digits (i.e. 0035 would be 035), try that if all else fails. Magnavox Support (21) Search for your model. Alternate Programming Instructions User submitted. Philips-Magnavox PM525S PDF manual. Identifying mark on the remote may be inside the battery compartment: HE016. This manual may work for a number of Philips-Magnavox remotes. Philips-Magnavox PM725 PDF instruction manual. Memorex VR3 PDF file containing codes. Memorex VR4 Also reported to work with VR3 and AV6. Memorex 4 Plus PDF manual for the Memorex 4 Plus. May also work with the 3 Plus. DirecTV Receivers (7) Models SR-HD5 and SR-SDI. DST-400 PDF instruction manual with codes. DRC-800 PDF remote manual for DRC800 4-in-1 universal remote control. DirecTV Receivers (7) RCA model instructions may also work. Various Models (26) Select your remote to download the manual. URC-XXXX Remotes (30) Lists a number of URC-XXXX models. URC-XXXX Models (30) Mirror of the old One For All site. The Director (24) Remote codes for The Director advanced touch remote. This appears to be the same as the Mosaic touch screen remote. Online Operating Instructions (28) Instructions for televisions, VCRs, etc. - look for your model of TV or VCR and find the online instructions that include the remote codes. DirecTV Receivers (7) Models listed: TU-IRD10, TU-IRD20, TU-HDS20, TZ-DBS01, TZ-DRD100. EUR511170B Codes for Panasonic EUR511170B and perhaps others. DirecTV Receivers (7) Models listed: DSHD800, DSR 660, DSR 7000-17, DSR 704/708, DSX-5150, DSX-5250, DSX-5350, DSX-5353, DSX-5375, DSX 5500/5540. Philips-Magnavox REM 250 (50) PDF manual. PMDVD6 Universal Digital DVD Instructions and codes for PMDVD6 Universal Digital DVD 6 Device learning remote. Philips PM335 Manual PDF remote manual. You will also need to download the codes. The instructions may also work for the PM435. Philips PM335 Codes PDF file containing remote codes. May also work with PM435. For Visio TVs try Goldstar codes such as as 0002. PM-RC8 PDF instruction manual for the PM-RC8 remote. DirecTV Receivers (7) Models listed: PRD8630A, PRD8650B, PS61000. Various Codes (45) Various RCA universal remote codes. Numerous Models (11) Instructions for many RCU and SystemLink models. DirecTV Receivers (7) Models listed: DRD + DTC Models (and more). CRCU500 PDF file with codes. SystemLink3 (29) Admiral TV alternate code: 047. SystemLink 3 (aka RC300E and RCU300) (33) PDF manual. SystemLink3 Programming User-submitted programming instructions. SystemLINK4 User submitted instructions for SystemLINK4. SystemLink 6 User-submitted code search instructions. RCA SystemLINK Code Search Instructions Reported to work with models 3, 4+, SL5 and maybe more. 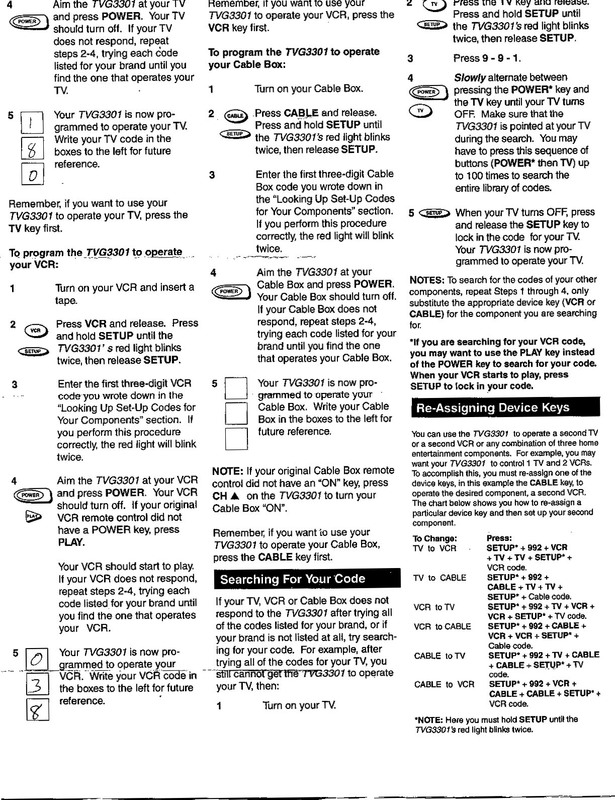 RCA SystemLINK3 PDF instruction manual (~2MB). TRCU500 (aka SystemLINK 5) (33) PDF file with codes. VR651HF VCR Remote Rich Text Format (RTF) file with codes. RCU1000B (33) Touch screen remote PDF file. RCU404 (45) Instruction manual (PDF). For Insignia TVs try 062. DBS-D770 PDF manual for RCA remote that comes with some direct broadcast satellite (DBS) systems. RCR460 PDF file containing codes. RCA CRK76DBL1 PDF Reference manual. Various Models (32) Lots of info on at least the following models - look here for any Radio Shack universal remote: Six-In-One, Three-In-One, Easy VCR Programmer, Five-In-One, Light-Up, Itza-Remote, Pocket Remote, 3-in-1, Phone Up 4, Eight-In-One, Four-In-One, 6-in-1, 7-in-1, and more. Various Remotes (31) Models Listed: ITZA 2, ITZA 2000, 2-in-One Universal, 3-in-One Pocket, 4-in-One, 4-in-One Light Up, 4-in-One Smart Light Up, 6-in-One Smart Audio, 7-in-One IR/RF, 8-in-One Touchscreen. Jensen/Recoton went into bankruptcy and the video accessories division was purchased by Thomson Electronics. Unfortunately the original Sole Control website is no longer active. You can try contacting Thompson Electornics or their subsidiary company RCA for information. Web Archive of solecontrol.com Some pages of the old Sole Control web site mirrored at the web.archive.org internet archive. Sole Control SC-440 Auto Search Instructions submitted for using the auto-search feature of the remote. Sole Control SC-300 Series European Version PDF file with codes for European version of Sole Control remotes from Recoton UK. Product specs are different than US versions. Models Listed: SC-310, SC-315, SC-320, SC-330, SC-340. Sole Control SC460, SC460R and DSC460 PDF instruction manual. Samsung Support Site (35) Click on your component, look for the manual for your model. DirecTV Receivers (7) Models: SIR-S60W, SIR-S70-75, SIR-TS160, SIR300-310W, SIR-S4120R, SIR-TS360. Sanyo Service (37) Click on REMOTE CODE & PROGRAMMING link to list and search for remote models. B21208 Comes with the Sanyo VHR-H619 VCR. Also reported to work with Sanyo B21309 remote. VWM-677 Part 1 PDF file for part 1 of Sanyo VCR manual. VWM-677 Part 2 PDF file for part 2 of Sanyo VCR manual. Sharp USA Support (40) Enter your model number to search for manuals. Remote for VC-H982 VCR Also reported to work with the VC-H952, VC-A582 ,VC-H965, VC-H812 and VC-H818. Remote for SD-SP10 PDF codes and programming instructions for the remote that comes with the SD-SP10 audio system. The remote model number is RRMCGA086AWSA. Sky+ (41) PDF manual for Sky+ remote control. General Codes and Instructions (43) General instructions and codes for Sony remotes. Check here if your model is not listed below or does not contain complete instructions. Sony eSupport Sony's main support site, enter or select your remote model. RM-V8 (12) May also work with RM-V7. RM-V12 Setup Extra instructions for the RM-V12 using codes from the RM-V8. RM-V10 Instructions from Sony Internet. RM-V11 Also reported to work with RM-V10A. RM-V18A Instructions from Sony Internet (also reported to work with RM-V14). RM-V21 Instructions from Sony Internet. RM-V40A Instructions from Sony Internet (also reported to work with RM-V60). RM-Y102 Instructions from Sony Internet. RM-Y119 and RM-Y117 May also work with RM-Y118. RM-Y165 Also reported to work with RM-Y135, RM-Y154, RM-Y167, RM-Y168, RM-Y169, RM-Y170, RM-Y171, RM-Y181, RM-Y186, RM-Y902, RM-Y906, RM-Y144, RM-Y180. RM-Y135 Also reported to work with RM-Y136A and RM-Y137A. RM-PP404 Remote that comes with the STR-DE545 home entertainment system. RM-V302 Instructions PDF instruction file. RM-V302 Codes PDF code list. RM-VL700 Instructions PDF instruction file. RM-VL700 Code List PDF code list. RM-LP204 and RM-LP204M PDF instruction manual. RM-AX4000 Manual PDF instruction manual. RM-AX4000 Code List PDF code list. DirecTV Receivers Models listed: HD100, SAT-A1, SAT A2/B2, SAT-A4/B3, SAT-A50/B50, SAT-A55/B55, SAT-A65/B65, SAT-A65A/B65A, SAT-HD200, SAT-HD300, SAT-T60, SAT-W60. STAR TREK Phaser Universal Remote PDF user manual for Star Trek: The Next Generation phaser remote. Owner's Manuals (49) Links to PDF versions of the owner's manuals to many components. Models listed: DST-3000, TSR101, TSR202. (7) Models listed: DST-3000, DW65X91, TSR101, TSR202. Note: See the Cox and One For All sections for more possible remote codes. Various Cable Remotes (52) Models listed: Atlas, Mundial, Millennium, Navigator, Scout, Control. Mosaic (24) Remote codes for the Mosaic Touch Screen Control. 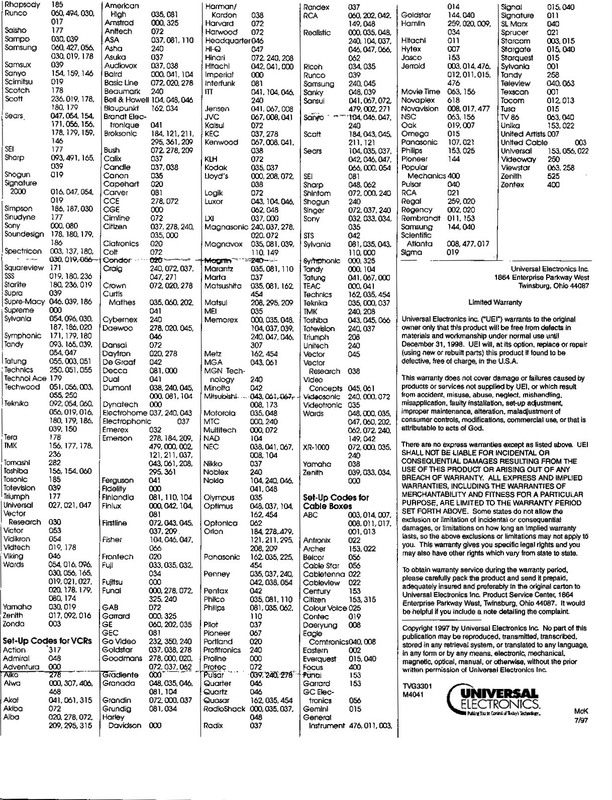 General Codes (30) Codes for most UEIC, One For All, and Radio Shack remotes. Little Easy One For All "Little Easy" remote instructions. 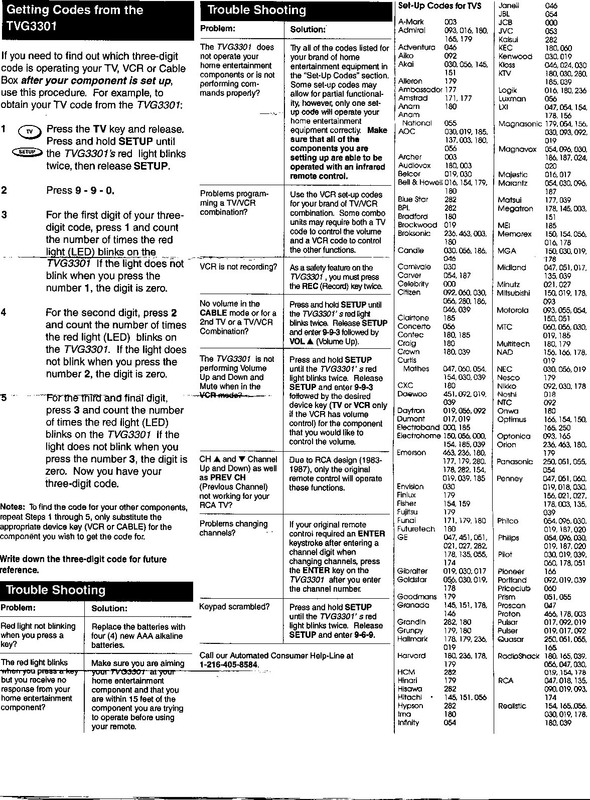 Various Remotes (53) Codes and instructions for most US Electronics remote control models. Verizon FiOS Remotes (55) Various remote controls used with FiOS TV set-top boxes. Universal Remotes (57) Various X10 universal remotes, including: MouseRemote, SuperREMOTE, 8-in-1 Learning Remote, UltimateRemote, TV Buddy, Platinum Remote, 5-in-1 Learning Remote, Entertainment/DVD/MP3 Anywhere Remote. Yamaha Remotes (58) Search for your model. General Zenith Codes (59) Should work with later model Zenith remotes, search for your model. ZN405S / ZN411 Manual for ZN405S and ZN411 remotes. DIRECTV Receivers (7) Covers DTV1080 and HD-SAT520. MBC4010 PDF manual for Zenith or Allegro MBC4010 multi brand remote 4. All remote names and brands are trademark of their respective companies.